SkyWatch Bird Rescue » Found a Baby Bird? April through August is considered baby bird season at SkyWatch, and during this time we receive a huge influx of young birds. 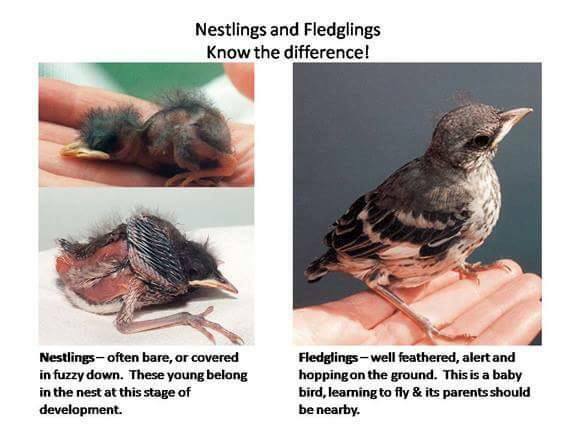 In order to prevent birds being “stolen” from their homes, it’s important to know the difference between a true baby bird and a fledgling bird. Baby birds found on the ground need help. Fledgling birds in most cases do not need help and have a right to be on the ground. When you find a (healthy and uninjured) fledgling bird, you have to leave it alone by law. There are however certain circumstances when you need to intervene. Read this full article to determine what to do. Baby birds grow and turn into fledglings. Once they “fledge”, they start coming out of their nests, hopping branch to branch till they end up on the ground. They stay there for up to a week or so learning how to fly and forage for food. They can’t just jump out of their nest one day and fly! Fledglings have to spend some time on the ground hopping and practicing flying short distances until they can begin to follow the parent out of the area. While on the ground, the mother bird has to leave them alone for short periods – up to 20 minutes at time – to go off and find food for her and the fledgling. It’s common during these periods for people to come across a baby bird that is alone and assume it needs help or is orphaned. Fledglings are supposed to be on the ground and this means that they are alone sometimes. Eight out of ten babies brought to SkyWatch is a case of mistaken identity. Well-meaning citizens accidentally kidnap the fledglings thinking they need help, when in fact they are just fine. Unless they are obviously injured or caught by a cat, leave them alone. The birds have a right to be there and it is against federal law to take them. 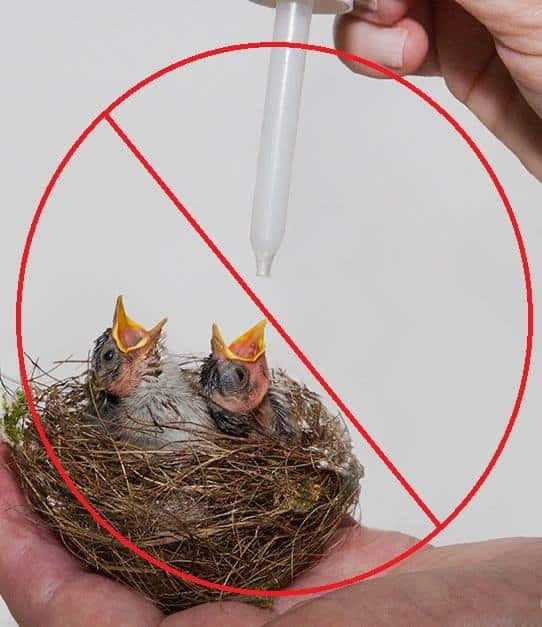 Just because you come across a baby bird in your backyard, driveway, on the side of the road or in a parking lot does not mean you can take the baby bird or that it necessarily needs help. See below for instructions on when you should take the bird and what to do with baby and fledgling birds. When should I take the bird? – If the bird has been in contact with a cat or dog in ANY way. – If you have visual confirmation that the mother bird is dead. – If you can’t reach the nest to put the baby back in the nest. Remember: There is a difference between BABY birds and FLEDGLING birds. You should never take a fledgling bird unless it truly needs help. I know what I found is truly a baby bird, now what? First: If you know where the nest is and can reach it, simply put the baby back in the nest. It’s ok to pick up a baby bird with your bare hands and put it back in the nest right away. Next: Clear the area and observe from a distance for 20 continuous minutes. If there is no activity from an adult bird within half hour, it’s safe to assume the mom can’t come back or is dead. You must right away put the baby bird in a small bowl lined with soft tissue or toilet paper. Cover the bowl with a small towel so they are snug and warm like in a little cave. Keep the babies warm and dark and quiet. DO NOT drip any liquids down the throat. This may work for mammals but you are actually causing the baby bird to aspirate or inhale the water into their lungs. Babies don’t drink water – they get all their fluids from the food they eat. Don’t put the baby in a big box surrounded by lots of empty space. Remember, the nests they grow up in are snug and cuddled. Don’t lift the towel and check on them too frequently. Every time you uncover them, you let the cold air in and compromise their temperature. Don’t talk too loud over the baby. To them we are like giants and our voices are really loud. In some cases the baby might be “gaping.” Gaping is when they stretch their necks out into the air vigorously and open their mouths really wide. Gaping is an automatic response for them, that’s how they ask for food in the nest. If they are gaping you can give SMALL bits of fruit like strawberries or dry cat food softened in a small bit of water and gently place it in their mouths with tweezers one bit at a time until they stop gaping. This is only a temporary fix, not a permanent diet. DO NOT give any bird bread. Bread has no nutritional value for them. Bring the baby to SkyWatch as soon as possible, especially if the baby has not eaten anything in over half an hour. Babies have to be properly hydrated and fed every 20- 45 minutes 14 hours a day and in some cases need to be hydrated intravenously right away. In the meantime keep the baby warm and dark and quiet. Baby birds must feel WARM to the touch. Looks like I found a fledgling, now what? If you find a fledgling in your backyard or a dangerous spot like in the road or in the middle of a parking lot, pick the bird up (you can use your bare hands) and take the bird over the nearest bush or shrub and place it in a shady spot. The mommy bird will be back soon and will find the baby. The mommy may already be back, but she won’t approach her baby while people are nearby. She is sitting nearby waiting for the people to leave. Remember, birds don’t know you are trying to help and to them we are the same as predators. If the bird sits by itself without any parent coming by for a full 40 minutes, then you can go back and take the bird but you can only be sure if you can continuously observe the bird without looking away for a minute. Remember, it only takes a few seconds for the mom to come down and pop some food in the baby’s mouth and fly off again, so you may miss it and think that the bird is still alone. If you have cats or dogs, try to keep them away from that area for the next few days. If they must come in, follow the instructions above on how to handle a baby bird.